Curtain Call Challenge Reminder and a farewell! Welcome back. I feel as though I haven’t been here on a long time. It has been very busy. As of you who follow me on Facebook, you will know I have been renovating a property of mine after tenants trashed it last week. It all happened when it was time for them to vacate and we did not extend the contract. We wanted to see the property because we had not looked at it for a year and we wanted to give a fresh lick of paint. Now, for past two weeks, we as a family has been spending time renovating the property and it has been exhausting. That is why I have been MIA. Most of the work is done now. Only small jobs left. By tomorrow all will be done. It has been a great learning experience for somebody like me who has not done trades. Looks like I can now handle it and learnt some tradie language as well lol! Anyway, today I have a second and last card for Curtain Call Challenge. 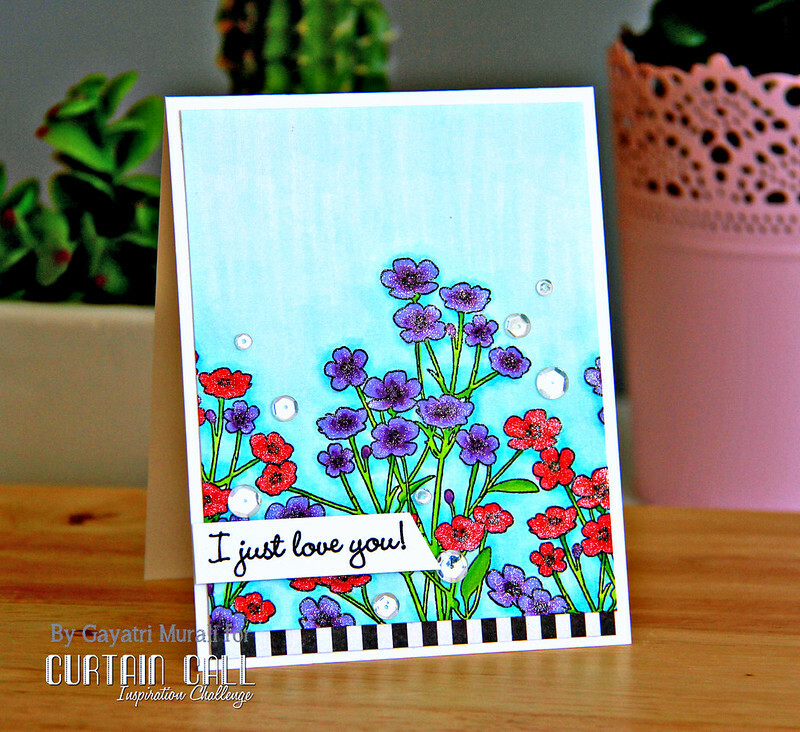 There is time still have time to play Curtain Call Challenge – Bouquet sponsored by Penny Black. 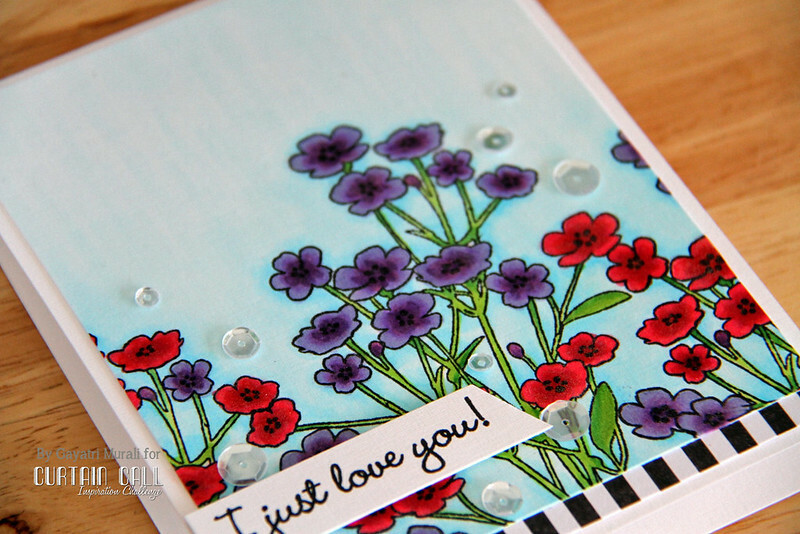 I have used Pretty Petals stamp set from Penny Black to stamp and copic colour. I paired the coloured panel with black and white pattern paper from Beau Jardins pattern paper pad. I have accented the card front using Pretty Pink Posh’s Sparkly Clear sequins. Come and play the challenge. there are two prizes from Penny Black to be won. So when I said last card, I meant that I am stepping down from the challenge. I have been in Curtain Call Challenge for past two years. I thought it is time for me to step down and give another talented designer a chance to be on this gorgeous team. I am sad but I had a great time. The team is awesome, Stacey is a great person to work with. Very approachable and flexible. I have been very lucky to work with such wonderful people. Thank you so much Stacey for having me. Love ya! Sorry about your rental…that's horrible that you guys had to clean it up. I own a rental too and I'm always worried about stuff like that. Your CC card is gorgeous…love your work…sorry to see you step down but I'll still be following your work! you are such an inspiration! Gorgeous colouring of the image! Sad to see you leave our team, but thrilled I got introduced to your work and can continue to follow you in cyber world 🙂 Glad the renos are done – renters can be a joy or a total pain! Glad you got rid of these. You will be missed. I love this card Gayatri. The colours are stunning. Glad your renno has gone well. Sad to hear you're stepping down, though I can understand. 😉 Know, your work is amazing and inspiring! SO sorry to hear about all of the mess and work, glad it's almost finished. What a pretty card today, love those dancing flowers! You will be missed on the team, you've done an amazing job! Gayatri, fascinating card as all you make! It is really sad to read that you are leaving the team, your style will be missed.